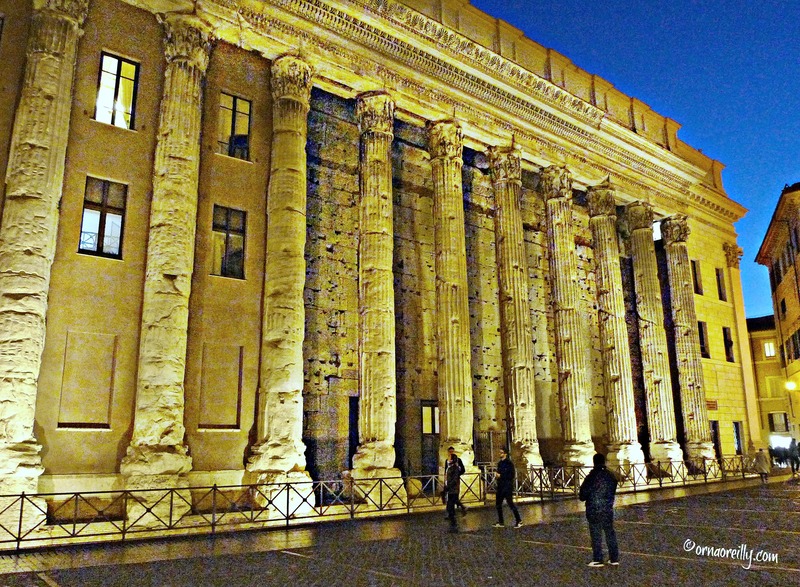 Winter in Rome is idyllic, but winter in Rome by night is spectacular. Uncrowded in the crisp, cool evenings, the streets are a joy to explore, where locals and visitors alike stroll around the beautiful fountains and monuments after dark, unimpeded by the summer hordes. When we discovered that the second evening of our ‘Winter in Rome’ blogging event comprised a night-time cocktail tour, we were looking forward to the experience. The sun was setting and the air was cool as we headed out to sample this promised variety of cocktails, courtesy of The Roman Guy; a tour company that offers a wide variety of private or group tours. They are based in Rome, Florence and Venice. 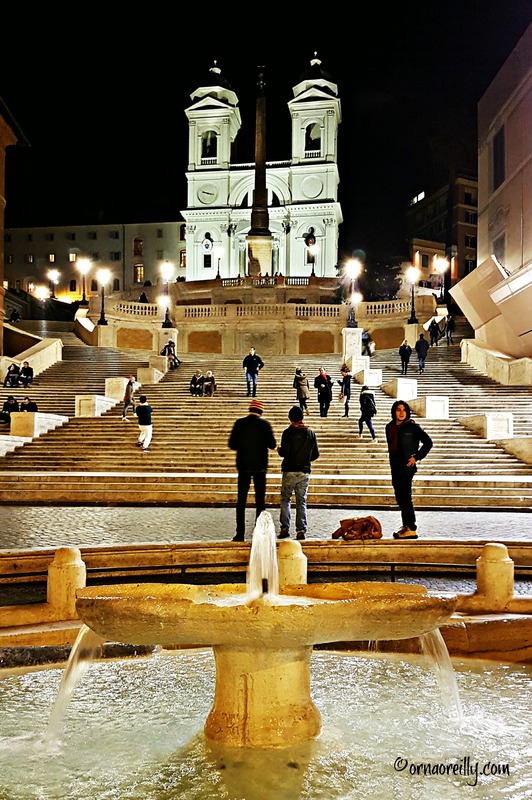 Leaving our hotel at the top of the romantic Spanish Steps, we paused to admire Piazza di Spagna, with its bubbling fountain, spread below us. Descending those famous steps, we strolled down Via dei Condotti, the fashion epicentre of Rome, and marvelled at the myriad expensive designer shops as we made our way towards Via del Corso, en route to Piazza Colonna where we were meeting up with a band of enthusiastic fellow bloggers enjoying a weekend organised by Linda Martinez, of the friendly Beehive Hostel conveniently located beside Termini, the main railway station. 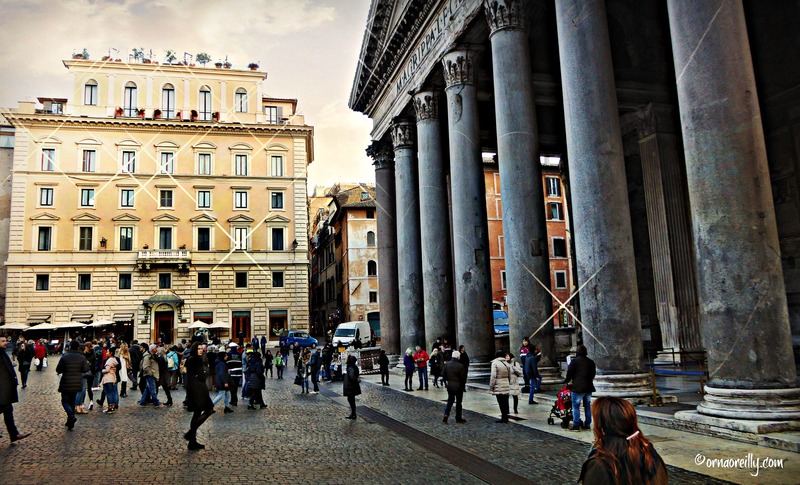 ‘Winter in Rome’ was the theme of this blogging event and we had been invited to try out a few of the many specialised excursions organised by the various tour companies in Rome over the winter season. On this particular evening, it was a walking Cocktail Tour, courtesy of The Roman Guy. On arrival at Piazza Colonna, we were greeted by Lorna and Sian from The Roman Guy, two lovely, friendly young ladies who were chatty and great company. Both English speaking locals, they were curious to know if we were aware that Rome boasts a fashionable cocktail culture. This was something I had no knowledge of whatsoever and was interested to see what was on offer. The Roman Guy advertises this Cocktail Tour as an alternative to visiting the plentiful wine-bars in order to sample cocktails made by, allegedly, the best bartenders in Rome. 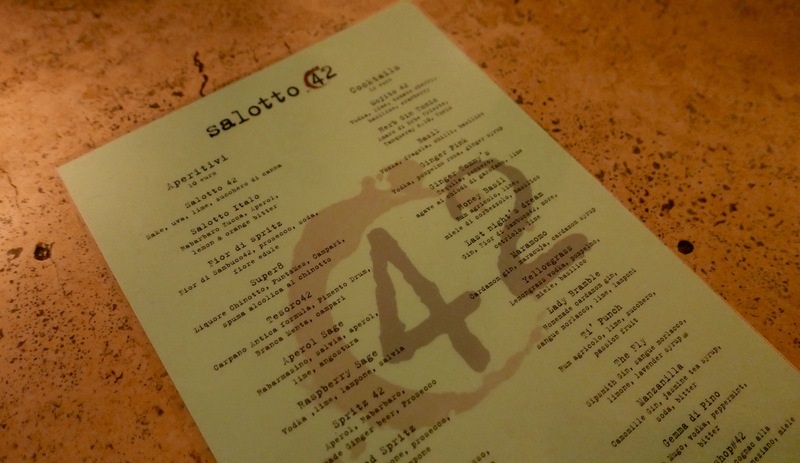 This Cocktail Tour is a way to see the city after dark and four eclectic bars were on the agenda. Led by Lorna and Sian, we were promised lots of information about the local culture, history and folklore as we walked. Starting at Piazza Colonna, we were due to finish up later in the charming, cobble-stone streets of Trastevere, having been guided through the local nightlife scene. Four different locali (locations) in three different neighbourhoods were on the agenda, passing, on foot, some interesting sights, for example Tempio di Adriano (Temple of Hadrian). After a five minute stroll we arrived in Piazza di Pietra, where Tempio di Adriano occupies one side of the beautifully lit square. A lively cocktail bar awaited us and we were soon seated and studying the exotic cocktail menu. I plumped for something called ‘Frida’s’ with a Campari base and black salt around the rim. Who knew such a thing existed! I’ve obviously led a sheltered life. From there we strolled for ten or fifteen minutes through winding streets, past many monuments and interesting historical sites, including the magnificent Pantheon. Our second venue was a busily, humming bar with plenty of tables outside. However, as it was quite a chilly evening, we all voted to go inside. Two more bars followed and the delicious cocktails drunk in atmospheric surroundings amongst the local fashionista, made this very authentic evening relaxing in the extreme. 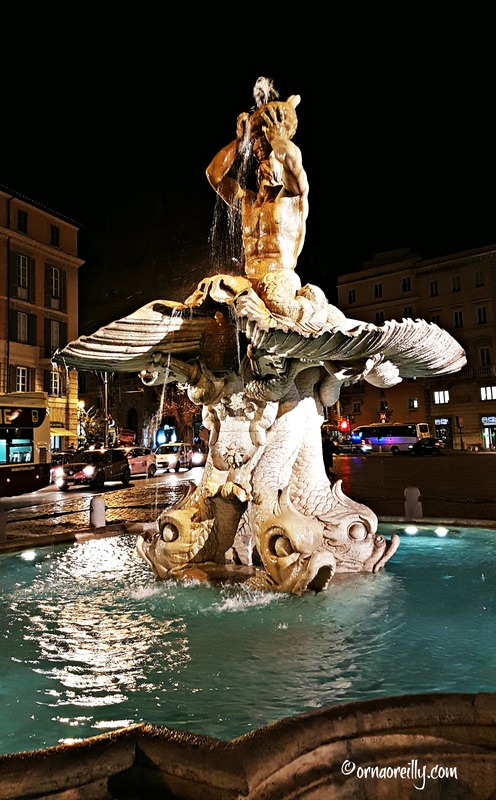 As we strolled back to our hotel later that evening, we happened on the magnificent Bernini Fontana del Tritone in Piazza Barberini. 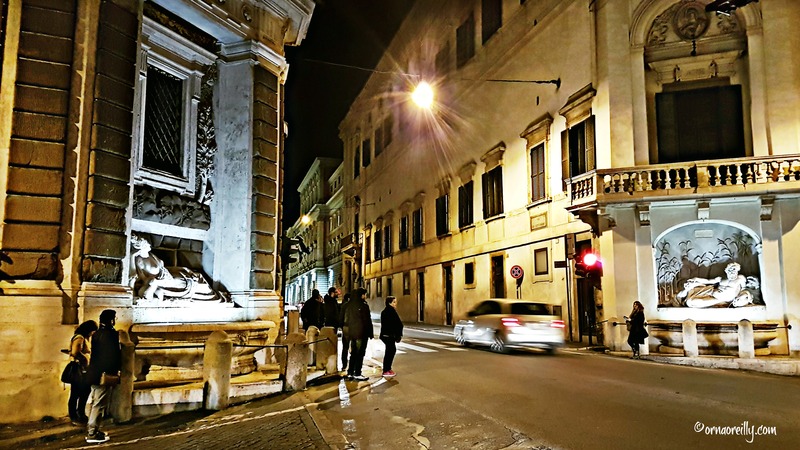 We then took a street which led us, briefly, in the wrong direction and came upon the famous Quattro fontane (four fountains) – a lucky mistake, for sure. 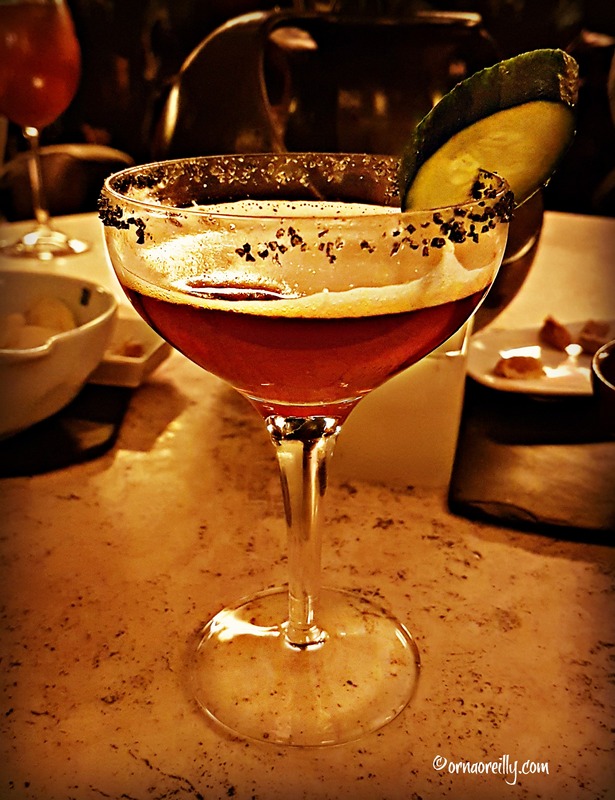 I would highly recommend this Cocktail Tour to anyone keen to mix with the locals and enjoy a night out in some very fashionable Roman bars. Rome at night is extra special. If you would like to book a tour with The Roman Guy, click HERE and use this Promo Code #LOVEROME for a 10% discount on their Small Group Tours and mention my name! It looks magical. I have never seen the Spanish steps with so few people. Delightful. Winter in Rome is absolutely the best time to explore. No crowds. No queues. Brilliant. All you need is a warm coat and boots! Wow, Orna, looks fabulous, both scenery and food/drinks. I’m not very knowledgeable about cocktails, but it would be fun to try and learn. I love the mostly empty streets and the lights. 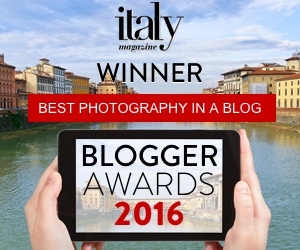 BTW, congrats on the blog award! Nice narrative, Orna and the pics are top notch. So, how was that Frida? What a fun tour!! The Roman Guy people are great, I had some tours with them a couple of years ago. I agree that winter is a great time to visit Rome. And your photos are always beautiful, Orna! Really beautiful nighttime photos! I love the Tempio di Adriano, and I’m pretty sure I shared a bottle of expensive wine in that bar. I was studying at an intensive language school in Rome, and one day the Swiss policeman in my class uncharacteristically and also quite quietly asked a couple of us to join him for a drink that evening. He insisted on treating us, and as we sipped our wine, he confessed that he had won 30,000 Euros in the Italian lottery the day before. Well, when you’re far away from home and family, you look around for the next best thing – a couple of classmates at your language school. I don’t remember any champagne, but I’m not a big fan, so I was quite pleased with the very nice red wine.